We carry a large selection of wedding jewelry including engagement and wedding rings primarily in 18K and 14K Gold and also in contemporary metals such as tungsten, titanium, and stainless steel. We can custom design wedding jewelry to your specifications. We carry men’s Comfort Fit wedding rings that are designed with a rounded surface against the finger. They are available in 14K, and 18K white or yellow gold and platinum in sizes 2 – 17 and from 2 – 8mm in width. The Comfort Fit rings can also be custom engraved. 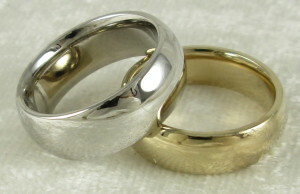 Stop in today to choose or order your wedding rings.